AstroNest has already been in service for four years now. We appreciate your love and unending passion towards AstroNest. 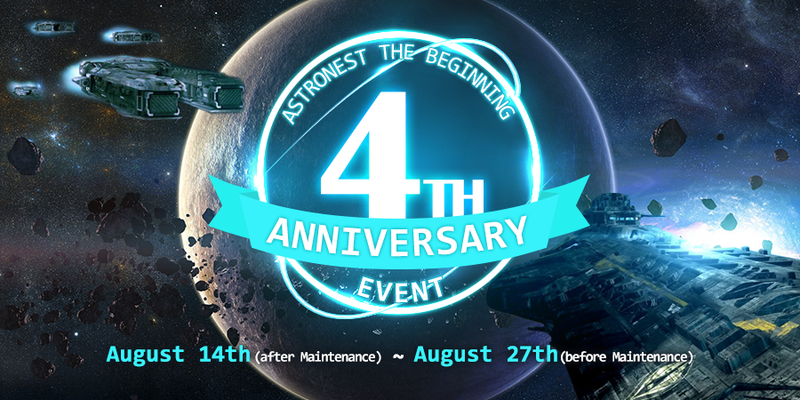 We have prepared many events to celebrate AstroNest’s 4th Anniversary. Please check carefully and don't miss anything! The Faction War will be held for a total of four days during the first two weeks. As soon as Round 1 begins, be sure to give it your all! The Faction War will have a total of two rounds. The victories of the top 1-500 commanders on each factions will be added together, disregarding servers. The side with the most total victories will win the round! Faction rewards will be awarded to Commanders who have total of 100 or more victories in the first and second rounds. If there is a tie after both rounds are complete, winning faction rewards will be awarded to everyone. Participate in battle during the 4th Anniversary Event and earn rewards! The Login Event will take place during the entire 4th Anniversary Event. Visit on weekdays to gain item drops! Log in on the weekends to receive Master Scouts and crystals! Don’t miss out on any! * Rewards will be reimbursed when you restart the game at least once each day. Otherwise, rewards may not be paid. * The time is based on UTC time. Two Heroes will appear during this period as rewards. One of them is a hero who have been always at the top of this game. And the other is a newcomer who finally made his way to the Astronest Universe after long journey. Both heroes can be found in the Drop Event Rewards tab. Log in and check it out! All previous Unique Heroes will return during this event! When you get a Unique Hero, you’ll have a higher probability of getting that day's Hero!. Please check the schedule to find the best time for the Hero you want. Don’t miss your chance! * The scheduled Hero’s image will appear on the Hero Scout Screen. * Please be sure to restart the game to see the new Hero’s image. No refunds or reimbursements will be given for not checking. * The time is based on UTC time. No refunds or reimbursements will be given for not checking. 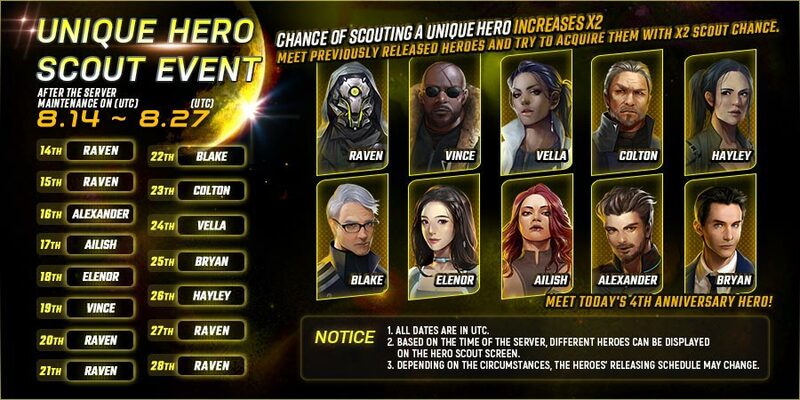 * If you use a Scout at the Hero change time, you will receive a Hero from the next scheduled Hero lineup. Please be sure to check the time. This event is day-based to allow Commanders from all over the world to enjoy the event. We understand that time-based events are often confusing. Please note that Heroes appear each day from 00:00 to 23:59 UTC. During the Event, the chance to obtain a Unique Hero will be doubled. If there is a Unique Hero that you have always wanted, don’t miss this opportunity! It will continue until the end of the event period. Tap the exclamation point in the left corner of the Scout Screen to verify that the drop probability has changed. Thank you so much for enjoying AstroNest: The Beginning for 4 years. We promise to do our best to provide better and better service in the future. Thank you to all of our Commanders!